Here’s a recipe for a chutney that couldn’t be easier to prepare. It needs just two ingredients-onions and red chillies. This is something I learnt from my mother. It serves as the perfect accompaniment to idlis and dosas. Heat oil in a large pan and add the chopped onions followed by salt. Sauté for 2-3 minutes and then add the red chillies. Continue to sauté on medium heat till the onions cook down and turn soft and brown. This takes almost 20 minutes. Cool the mixture and grind to a smooth paste. This is my entry for Zorra’s Onion Day celebrations. my mom's ulli chammanthi was the best. but each time i make it, it tastes bitter. wonder why. i make this chutney most often at home. even have a post in my blog :) i often add tomatoes when i am too lazy to chop all those onions. I love chutneys and I'm sure this on is excellent! Thank you for joining 2nd Onion Day. That's all there is to this chutney?! I have been trying to get a recipe forever. I am making this right away with dosas! My son is going to be so pleased - he always asks me to make this but I didn't have a recipe. The ones I tried earlier had too many ingredients...Oh, this is so good, and perfect timing. Thank you, thank you! That's it? That's all. I'm gonna try this. Nice chutney! We call this karachutney! You are tagged for a meme! :) Check my blog dear! Really...Just the two is enough for this delicious chutney? I have to do this. Thanks for sharing it. I love this one! Its perfect for idlis & dosas.. smear this on the inside of the dosa & it tastes great! Thanks for a nice recipe. Oh girl! You really surprised me with this one, it looks beautiful and I had never heard of onion chutney, love it! congrats on winning the cookbook! btw what was the rcp u entered? Nice and simple!!! i'm surprised no cumin, no tomatoes!! WOW!!! That looks great! Simple and delish! 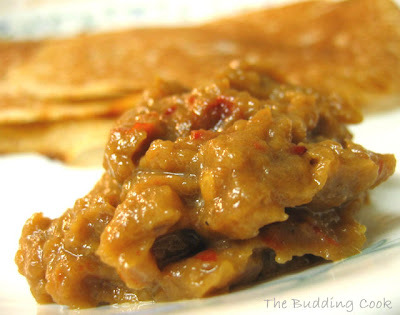 I love Onion chutney, any way its made!Yours looks nice..
onion chutney is one of my fav..which kind of onions do u use? regular or shallots? i use shallots and add some tamarind too. Not just idli and dosai, this one lights up many a bread toast for lazy people like me :-D. i want some now. My amma makes it too but in a different way..She grinds shallots and tamarind and adds oil to it! TBC, it cannot get any simpler then this, like bee when ever I tried it turns out bitter too. wonder what I am doing wrong. Me too have one, but color is so different..
That's just too, too easy! I love jars of condiments cluttering up my fridge. Just a spoonful can snazz up the simplest meals. Looks good. We too make it to spread on the dosas. Peach and Mascarpone cups looks yummy my dear. First time heard about onion chutney. Looks delicious I will try!!! Also enjoying the little sauce dish -- is that antique? Make this too but with a bit of urad dal and tamarind. Adding half a tsp of raw coconut oil adds a lovely flavour and taste ( even though I don'treally like coconut oil). 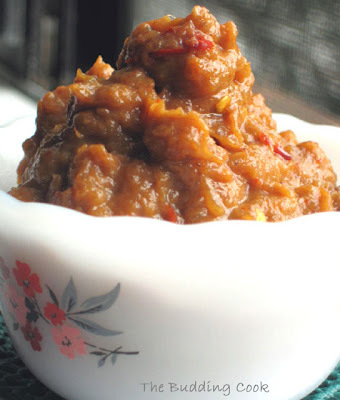 I love this chutney.adding some jaggery or sugar will give a superb taste to this one. I love chutneys. Thanks for the simple recipe. It sounds delicious! So simple and yet sooo good! Hey TBC..was here to post comment on the pineapple pudding..got to see this chamanthi..its my fave and i learnt it from hubby's grandmom..its too delicious to resist!!! I have posted it along with dosa last week. Btw-even after reading your post of pineapple pudding, with condensed milk, i made a error, i used fresh strawberries so it hasnt set..nevertheless the taste is awesome! i used 2 tins of 90gms condensed milk, 2 1/2 tsp of cherry flavoured gelatin and 5 big st.berries...its awesome..thks for posting it..shall try pineapple too..but hunting for unflavoured gelatin...tc..tks..
TBC..just a query..you hv tagged this chutney under spring onions..did u experiment with spring onions or hv u used our indian red onion here? Thank you so much for your feedback. I really appreciate your comments. Unfortunately, I am unable to respond to each comment separately due to time constraints. and thank you ...I've never won anything before! Mallugirl-I used equal amounts of red onions and sweet Vidalia onions. wow onion chutney is quite unique to me...am bookmarking the recipe. I can never ever have enough of this variation of the chammandi. Gosh, it really makes me have a whole bowl of just pure ulli chammandi!! Nothing else. The spicier & tangier the better!! This is in reply to your reply to my question!!! I live at Kakkanad, too. Hey sweetie, are you away for the holidays? Miss you. Hope you have a good one! Take care. Looks extremely delicious and easy to boot. Dosas are a staple at home. This will be tried out very very soon. very easy recipe! I think this would taste great on top of my roasted potatoes too. Thanks, Kamini. Do let me know how you like it. Jaden- Now there's something I would never have thought of! Yum,Yum and YUM!!!!! I love chutney so much. How nice your onion chutney recipes. this is such a nice and interesting recipe. I ve never heard of it before but sounds delicious. ooooooooh! my mouth is watering. Can't wait to try it. i ll make this weekend when my hubby will be at home. thank you for shearing your post.